Surface Pro is defined by Microsoft as one mobile device with the functions of a laptop that can replace your tablet, laptop, and maybe even desktop. It's equipped with desktop functions to be productive while keeping enough thin and light to be portable. If you want the convenience of mobile devices while looking for the versatility of desktop OS, Surface Pro is an outstanding device. Among all those attractions of Surface Pro, its biggest improvement comes from its larger-and-better display, making itself an ideal device to watch movies. However, every bean has its black. As other tablet PCs, Surface Pro does not support direct playback of DVDs. To play DVD on Surface Pro, you need to rip DVD to Surface Pro 3/4/5 supported video format first. To convert DVD to Surface Pro can be hard, but it can also be very easy, all depending on the tool you choose. Among a myriad of DVD rippers for Surface Pro 3/4/5, MacX DVD Ripper Pro stands out with its strong DVD ripping ability. This Surface Pro DVD ripper is widely recognized as the most efficient and useful DVD ripper for Surface tablets. Besides its powerful capability to support ripping DVD to Microsoft Sufrace series, including Surface RT, Surface Pro 3/4/5 as well as other game consoles and devices, one of the most important reasons lies in its unparalleled ability to rip all types of DVDs encrypted and copy-protected by DVD CSS, region code, RCE, Sony ArccOS, UOPs, Disney, etc. With this DVD ripping software for Surface Pro, you can freely rip any favourite DVDs to your Surface Pro 3/4/5, including the hottest DVDs as this DVD ripper for Mac updates constantly to support to bypass the latest copy protection. Download and run the DVD decrypter for Surface Pro, click "DVD Disc" to import the DVD files. There are many profiles for different devices in the menu, like rip DVD to Apple iPhone, iPad, Android Mobile Samsung, HTC and etc. For DVD to Surface Pro 3/4/5 conversion, you can just click the "Microsoft Device" in the "Output Profile" and choose "to Surface Video". Click "Browse" button in output setting area and select a destination folder to save your converted video. In addition, many other advanced parameters are also available for you to customize your output video. Click "RUN" to rip DVD to Surface Pro on your Mac computer. With this this DVD ripper for Mac, you can finish DVD to Surface Pro ripping with 5x faster speed and outstanding quality. Note: If you prefer high quality output video, you can achieve this by three means: Set the quality to HD; select "Use High Quality Engine" option; raise "kbps" in "Video Quality" setting area. 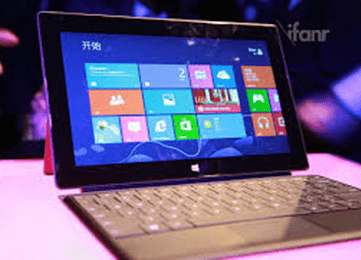 In fact, this DVD to Surface Pro ripper contains all the features you want about a DVD ripper. 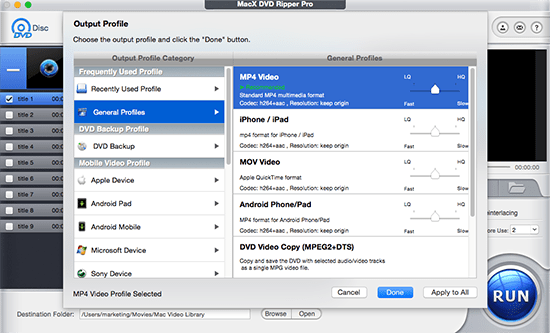 This MacX DVD Ripper Pro can rip DVD to FLV, rip DVD to MP4, DVD to MOV, MKV, M4V, AVI, QT and etc for playback on any mobile device like iPhone X/8/7/SE/6s/6, iPad Air 2, Galaxy S9, HTC One, Google Nexus 7, Kindle Fire HD, etc. Here's another great helper, MacX MediaTrans, which can transfer the DVD movie file to iPhone iPad etc. mobile devices in a flash without iTunes syncing. Ultimate DVD ripper for Mac brings you the best solution to copy and rip the latest encrypted DVDs like Deadpoo 2l, Avengers, Jurassic World etc. 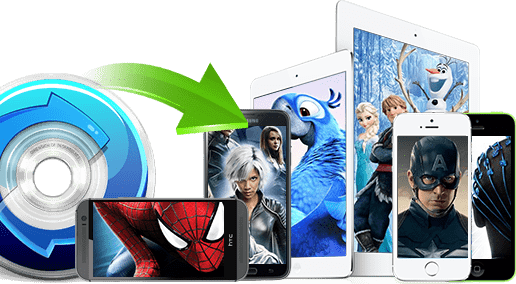 Constantly upgrade to support ripping DVD to Surface Pro 4, and other latest devices like iPad Air 2, iPad Mini 4, iPhone SE/6S/Plus/7/8/X, Samsung Galaxy S7/S8/S9, HTC One M10 and more with 5X faster speed and no quality loss.